A small settlement just under two hours drive north of Auckland, Waipu isn’t exactly what you’d call a bustling metropolis. Situated just marginally inland from the coast, and home to less than four thousand inhabitants, it’s probably not that high up on the list of must see destinations for most New Zealand visitors. Yet, in my first few weeks in the country, I was told to visit Waipu more than any other location. The reason, naturally, had little to do with the town’s (admittedly lovely) beaches or the large population of glow worms living in natural caves nearby, and everything to do with a certain amber nectar of which I happen to be rather fond. I was made aware of McLeod’s Brewery pretty much on day one working at 16 Tun, being taken completely by surprise that this traditional-looking brewery was producing some of the finest hazy beer in New Zealand. The brewery takes its name and branding from the Scottish ancestry of Waipu (the town was the centre of a significant Presbyterian settlement in the 1850s) but is far more forward thinking when it comes to its beers. Since the arrival of Jason Bathgate (formerly of 8 Wired) as head brewer in 2016, the brewery has been flying, picking up thirteen medals at The Brewers Guild of New Zealand Beer Awards this September, including 3 golds. Bathgate has drawn praise in particular for the brewery’s 802 range – a series of unfiltered IPAs made using different hop combinations (think The Kernel, but with NEIPA). 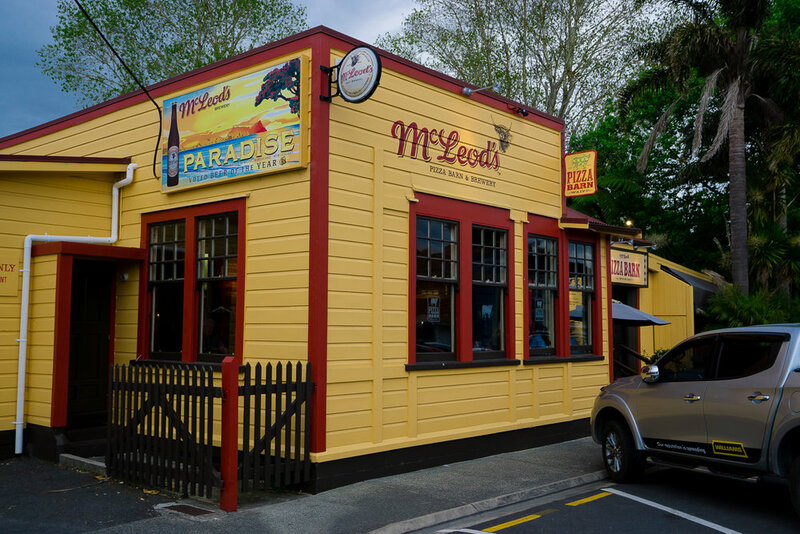 McLeod’s produces around 200,000l of beer a year, and I’d hazard a guess that a fair amount of that is sold through its Pizza Barn & Taphouse, which is one of only two pubs in the whole of Waipu. Thankfully, it’s rather a good one, and this is reflected by the fact most of the town seem to have decided to make it their local. The brewery started out of the Pizza Barn after founders Geoff and Clayton Gwynne decided they’d had enough of selling big beer, and the Barn continues to reflect that today, with over ten McLeod’s beers pouring on tap, as well as a cider from Peckham’s Cider Mill in the South Island. Our group plumps en masse for the latest beer in the 802 series (#12) along with our pizza. Made with Vic Secret and Amarillo hops, 802 #12 is surprisingly bitter, but still ripe with stone fruit and citrus flavours. Another highlight is the delicate, peppery Spring Sun Belgian Wit, made with coriander and fresh orange zest. 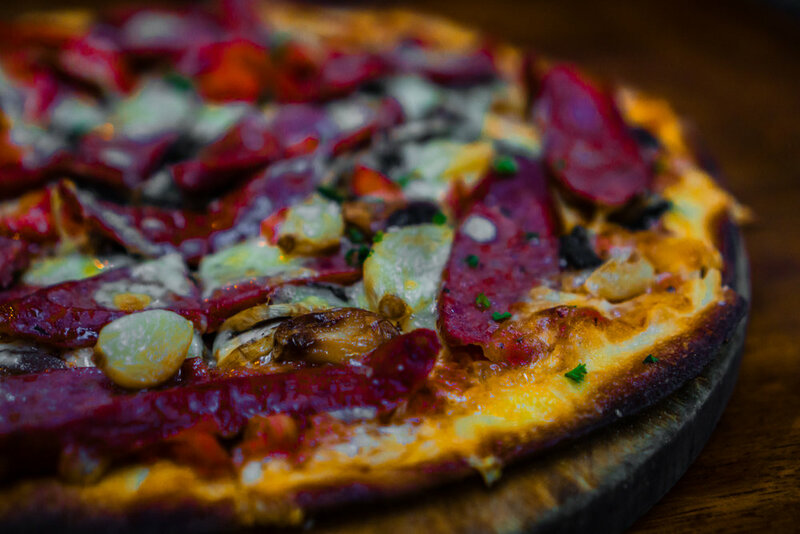 The pizzas themselves are objects of pure extravagance, piled with toppings and smothered in roasted garlic, and priced between $27-30 NZD for a large size. I opt for the Globetrotter, which comes with smoked vension sausage, mushrooms, streaky bacon, garlic, caramelised onion and peppers. Other crowd-pleasing menu options include burgers, chicken wings, pasta dishes and lamb shanks. The atmosphere is electric, with people of all ages and backgrounds sampling fresh beer and supporting a local business, which has in turn made itself the centre of a small community. It strikes me, as we depart the empty venue (having also been pretty much the first to arrive at shortly before 5pm), that there are more than a few small towns in the UK that could do with a venue like McLeod’s at the heart of them.